For over 20 years, CEO & President of CREATIVE TAX, YVEITE GEATER has provided exceptional accounting services at every level. She has built a solid reputation for providing a full-range of accounting services for both personal and business financial needs. Yvette’s work has been instrumental in assisting clients comply with tax laws and regulations and most importantly providing them with the assurance their tax needs are being addressed by a professional. Yvette began her career as a bank teller at City National Bank of Los Angeles where she learned first-hand the importance of having a thorough understanding of accounting procedures. With various promotions throughout her career, she continued her achievements resulting in the position of Controller for successful businesses such as The Law Office of Gary Freedman (Santa Monica), Classic Slip Covers (Commerce) and Shabby Chic Retail Furniture (Santa Monica). As Controller, Yvette was responsible for all accounting aspects including tax preparation, reconciling bank statements and asset accounts, overseeing the accounts receivable/payable departments, payroll processing, auditing financial statements and maintaining a daily cash flow. She also served as a consultant to her employers in the areas of assets, investment and cash management. She negotiated and prepared contracts with commercial vendors based on the needs of the business. Her responsibilities required her to train and supervise a staff of over 100 employees which included four (4) staff accountants. 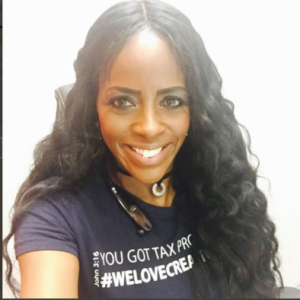 With success as a Controller in the private sector, Yvette decided to use her expertise in her local community thus, CREATIVE TAX was established in 1998. Through diligence and determination, she has managed to build a solid reputation by providing a tailor-made strategic plan for each client’s financial needs. Her clients range from small businesses to corporate with and annual revenue upwards of $3.5 million. She has amassed over 700 loyal clients which include 2nd and even 3rd generations of families. Unlike other corporate tax companies, CREATIVE TAX is staffed year-round with each team member employed for 5 years or more allowing CREATIVE TAX to provide the best professional services with a solid foundation and a personal touch. Yvette is well-versed in current tax laws (for multiple states) and keeps abreast by continuing her extended education year-round by participating in IRS approved webinars and tax law training. She is licensed/bonded and insured by the State of California. With the success of her business, Yvette has been commissioned for several speaking engagements most notably for, The United States Customs Department, City of Long Beach, Mary Kay, Children’s Home Society, Long Beach Black Chamber of Commerce and Serenity Seniors Homes.